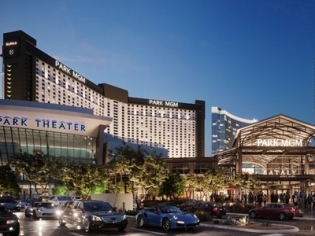 AAA members save the most at the Park MGM. Get 10% off your rates when you reserve online with this offer. Must present AAA card at check-in. Treat yourself to a Spring indulgence package at over three hundred restaurants, bars, lounges, and nightlife across participating MGM Resorts Las Vegas destinations. Receive a $50 Food and Beverage credit each night of your stay. Members of the armed forces save up to 10% off rates with this offer. Must present Military ID at check-in for discounted rates to apply. If you're a senior, you can now save 10% off standard rates for rooms at Park MGM, seven days a week. To qualify for the Senior Rate, you must be 62 years of age or older as of check-in date. Valid government-issued photo identification must be presented at check-in to confirm your eligibility. Park MGM is a relaxed resort right in the heart of the Strip. The European elegance of the hotel with marble, crystal chandeliers, and sculptured fountains is a luxury oasis with a casino and multiple fine dining options. 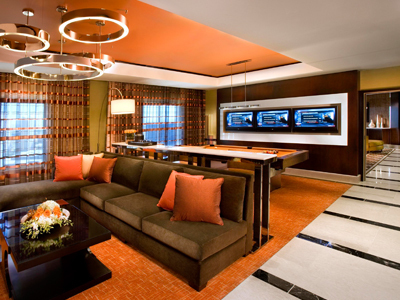 For the most exclusive option, book a suite in HOTEL32 and be pampered with over-the-top amenities. 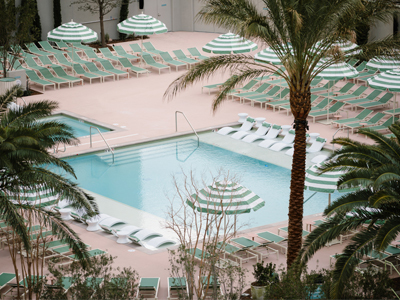 Visit Park MGM, a European-styled resort in walking distance to most of the must-see and must-do attractions Vegas has to offer. The guest rooms all offer 40in LCD HD TV’s, luxury mattresses and bedding, and marble baths. HOTEL32 offers premier suites, lofts and penthouses with personal assistants and extraordinary amenities. 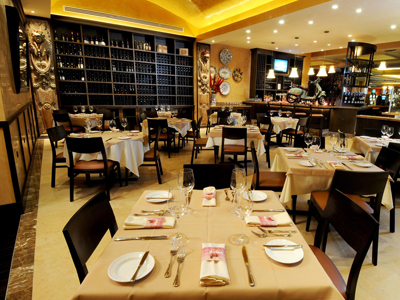 Dining options abound and include Bavette’s Steakhouse and Primrose. Entertainment options include varied performances and events at Park MGM’s nightclubs and lounges. Things are always hot at Ignite Lounge and exciting at Moneyline Sports Bar, so grab a cocktail at each of these hot spots! Blvd Plaza offers dining at Bee haus, Bruxie, and Sake Rok. America's All Time Best Selling Rock'n'Roll Band comes to Vegas for a residency. Grab your tickets to this limited run at the Park Theater. Bruno is an eleven-time Grammy winner and a 27-time Grammy nominee. The talented singer, songwriter and musician has sold over 180 million singles worldwide. A trip down nostalgia lane with Classic Cher is a great way to spend the evening with the iconic diva. Lady Gaga brings her new show to Las Vegas in what promises to be an outrageous celebration. Two unique shows are available. We had a nice experience here last month. It’s a good location off the strip. I loved the lazy river!! It was definitely my favorite part. The staff could have been more helpful at times, but it wasn’t awful. If you’re looking for a reasonable stay, check this one out. I stayed here for a week and I loved every bit of it! The room was up to date and very clean! Housekeeping was on point, kept every towels and cleaned only what I wanted touched. Great hotel to just throw on flip flops and run down to the store. Front desk was empty on my arrival, and allowed us to check in hours early! Hotel is located on strip with access to north or south side strip! Only complaint is the wifi sucked! Which should be better due that resort fee but overall Monte Carlo was a great host! My favorite on the strip! Very nice and clean! Speedy check in and staff is very friendly. It’s in a great area on the strip. The location isn’t bad but it lacks decent restaurants within. Never had a problem other than that. I highly recommend this hotel – the rooms were so clean, spacious, and comfortable. I did not want to leave! The bed was like sleeping on a cloud! My stay here was the ultimate Vegas stay. The staff was so friendly and helpful, the Brand Steakhouse was very delicious! I got to see Zumanity and I was so thrilled with the sensational acrobatics! Wonderful Vacation! My husband and I just came back from Vegas. We had a great time at the Monte Carlo resort. This was my husband first time to Vegas and I got him a strip view room, he loved it. The pool was wonderful. The staff was great. We had a little problem checking in but the manager took care of everything. I’m going back with the girl in October and we will be staying at Monte Carlo again. This is a great hotel. My fiance and I stayed at the Monte Carlo and had a blast! Beautiful prostitutes are around at nite time for pleasuring male guests. Plenty of weed to smoke just right outside on the strip. Very nice i will most definitely stay at Monte Carlo again !! Our room was great, the people were friendly, and it was right in the middle of everything! The only issue I had was with the shower head. It wouldn’t stay in one spot so it felt like I was showering in a sprinkler! The rates were reasonable and the restaurants had good food. I’d stay here again! We stayed three nights and it was like in paradise!!.. The check in line was a little long but the stuff members were so kind n friendly.. Our room was very clean and cozy with such a beautiful view!! The most important thing is the hotel location which is in the middle of Vegas blvd!! I wish I can visit here more often!! If you want a safe hotel, then don’t plan on coming here. You don’t see security ever and they don’t help you. They don’t care about their guests. Their safety. It only cost 10$ to get into the pool. Which means anyone can get into the pool area like criminals. Recently one of my items was stolen here and no one who worked here cared to help. We told security and they said they would try their best to help but have still not tried to do anything about it. This hotel is not reliable nor safe. Because of this occurrence i did not enjoy my stay at all. It was too pricey for what your receiving! We stayed for four nights and had a great experience! The pool is beautiful and We loved the lazy river. The variety of food options both inexpensive and more pricey is also nice. We would definitely stay again. The best Hotel in Vegas!!! It’s the best hotel in Vegas the spat suit is wonderful!!!! I hope I can go back soon!!! The check in lines were long. Our room was clean, but nothing special. We were not happy with te resort fee that got us next to nothing. The pool was alright. Nothing super special. The best part was the location, right in the middle of everything. I would come back again, we had a great rate. I felt the staff was very friendly, the rooms were nice and the tables were reasonable. The hotel has a monorail that takes you to the Aria, Crystals, Vdara and Bellagio. The walls are paper thin, we could hear everything our neighbors were saying. No coffee pot in the room. There is a CVS near by for drinks. The resort fee is high (15) and we got a newspaper and were able to print our boarding passes.